Many of us suffer from misaligned teeth and it’s only natural to want to correct the problem. Not only do straighter teeth improve your appearance; they also aid your oral hygiene. Although the teenage years are the ideal time to straighten teeth, braces for adults are becoming more commonplace as people make the decision later in life. With all kinds of different technologies now on the market, braces are more effective and discreet than ever. But working out which is the right type for you can be overwhelming. If you’re considering having your teeth straightened or have a teenager who may need orthodontic work, this guide is for you. We’ll tell you all you need to know about how the process works and the different types of braces available, including some of the biggest brands in the US. Of course we also have a section on the cost of braces for you or your teen, since price is a major factor with this type of treatment. 1 How do braces work? 1.1 Who can have orthodontic braces? 3 How much do braces cost in the US? 4 Can you straighten teeth without braces? 6 What’s it like wearing braces as an adult? 6.1 Do adult braces hurt? 7 How do I know if I need orthodontic work? There are several types of braces used in modern orthodontics, and we will cover these in full detail later on. Each one works in a slightly different way, but the main aim of braces for teeth is to correct problems with dental alignment. Who can have orthodontic braces? Teeth straightening works best when the teeth and jaw are still growing, but treatment won’t usually begin until most adult teeth have come through. This means the ideal age to start wearing dental braces is usually around 10-14. However, braces can still be effective at any age. The American Association of Orthodontics (AAO) has a selection of success stories and time-lapse videos which show what a difference braces can make in the lives of adults. AAO orthodontists treated almost 1.5 million adults in 2014. And while some adults may have them fitted for health reasons, in many cases it’s more to do with the aesthetic appearance of their teeth and smile. Straighter teeth can lead to better self-esteem at work and at home. One condition of having braces is that your teeth are in relatively good condition and you maintain good oral hygiene. If your teeth have already been damaged by decay, you have gum disease, or you have had extensive restorative work such as crowns, you may not be able to have all types of orthodontic treatment. In this case, you could consider veneers or dental implants to improve the appearance of your teeth. Wearing teeth braces as a teen can make you feel self-conscious about your appearance, but worrying about the way you look doesn’t stop when you reach adulthood. If anything, you become more aware of how you look. The last thing you want is the ‘train track’ look which makes it so obvious that you’re straightening your teeth. In fact, many adults and teens dislike the idea of wearing braces because of how others may perceive them. This is especially true if they have a professional appearance to maintain at work or have a big event like a wedding or graduation coming up. Adults might also worry they’ll look immature if they wear braces. Fortunately, conventional ‘metal mouth’ braces are no longer the only option for those wanting a perfect smile. Modern ceramic materials can be made to match your natural tooth color, while invisible braces like Invisalign are almost impossible to detect. This draws much less attention to the fact that you are having your teeth straightened. Below is a summary of the main advantages and disadvantages of dental braces of different kinds. Following that, you will find more detailed information to help you decide which type is right for you. Invisalign removable braces are a completely different alternative to conventional metal braces. They use a series of clear plastic aligners which fit over your teeth and guide them into their correct position over time. The official term for this method of teeth straightening is ‘clear aligners’, however, you’ll most often hear them referred to as ‘invisible’ or ‘removable’ braces. Invisalign Teen is a special type of aligner designed with features specifically for helping teenagers get the most out of wearing them. This includes an indicator to show your dentist or orthodontist whether you’ve been wearing them enough! It’s also an alternative to uncomfortable twin block braces if your jaw needs to move forward. Invisalign treatment is suitable for a wide range of orthodontic cases; in fact, 90% of people are suitable candidates for this type of brace. To find out if you’re one of them, take Invisalign’s free Smile Assessment. It just takes two minutes to complete some simple information about your teeth and you can soon find out if you’re a suitable candidate for Invisalign. If you choose Invisalign braces, your dentist or orthodontist will scan your mouth to create a 3D image of your teeth. This will then be used to plan your treatment. Your tailor-made aligners should be ready within a month of this initial consultation. The treatment consists of a series of aligners which you change for another set every one to two weeks to gradually shift your teeth. You’ll need to go for a checkup every six weeks to see how your treatment is progressing. Unlike other treatments, there is no need to worry about emergency appointments to fix broken wires. The average Invisalign treatment takes 12-18 months, but it can be shorter or longer depending on the degree of correction required. After that, you may be advised to wear a retainer every night to stop your teeth from moving back to their previous position. Invisalign braces are completely removable, which means you can clean and floss your teeth as normal, decreasing the chances of tooth decay and gum disease while you’re wearing them. However, they still need to be worn for 20-22 hours a day. Those 2-4 brace-free hours are for eating, drinking and cleaning, as the aligners are supposed to be removed to eat and drink anything except water. A positive side-effect of this that has been reported by some users is improved eating habits with less snacking. In short, Invisalign braces offer efficient and convenient teeth straightening that’s very hard for other people to notice. The fact that they cost roughly the same as other braces makes them the best type of braces for the majority of adults and teens. Our complete guide to invisible braces has more information on this teeth straightening method. But if you’re already convinced this is the right option for you, you can find your local Invisalign provider by clicking on the button below. Another option for people who want to straighten their teeth inconspicuously is lingual braces. 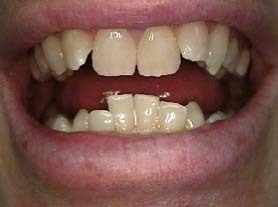 Although not technically invisible, the fittings go behind the teeth, facing inwards, so they’re hardly noticeable from the outside. These are also known as ‘hidden’ or ‘Incognito’ braces, (which is actually a brand name). The brackets fixed to the inner surface of the teeth can be standard fittings, but they can also be molded to the shape of each tooth individually. The latter option is, understandably, much more expensive. These braces are still visible when the mouth is open wide, but it is not immediately obvious that the person is wearing them. Despite this obvious benefit of lingual braces, there are several drawbacks that make them a less popular choice. Firstly, they are difficult to clean as they can’t be seen clearly and are in a place you’re not used to cleaning thoroughly. This positioning also means that adjustments at checkups take longer. Secondly, hidden braces can cause more severe speech defects than those that sit on the outside of the teeth. Most brace wearers experience some changes to their speech when their appliance is fitted, but with lingual braces, this can be more pronounced or take longer to correct. They are also more uncomfortable than some other systems as the brackets and wires are closest to the tongue. Finally, the treatment typically costs more than traditional styles. The brackets for ceramic braces are made from a material that’s either clear or the same color and texture as teeth, making them less obvious than their metal counterpart. Furthermore, the wire used to connect the brackets can also be tooth-colored. Because these work in the same way as traditional braces, they are just as effective. This does also mean that they carry the same potential for discomfort. The main downside of white braces is that the elastic bands used on them can stain easily if not cleaned properly. The material used also makes them more expensive than metal. For many people, ceramic braces provide a good balance between cost, speed, and appearance. Transparent brace brackets are not noticeable from a distance and are less distracting close-up. Treatment speeds can be comparable with clear aligner systems such as Invisalign. In terms of outward appearance, self-ligating braces are much the same as conventional styles in that they use a bracket and wire system. However, the modern technology used means that no elastic bands or metal ties are required to keep the straightening archwire in place. Some brands, such as Damon, have a clear option with transparent brackets for patients who are more image-conscious. The self-tightening system used in Damon braces combined with advanced technology heat-activated wires mean that the process of aligning teeth is relatively gentle. With traditional brackets, patients usually experience pain or discomfort after each adjustment, but self-ligating braces are constantly adjusting at a much more steady pace. The lack of rubber bands in this style of braces means they are more hygienic, too. The brackets are designed to hold onto less food than the traditional style. Self-ligating appliances can also offer faster treatments than traditional metal braces because they are more efficient at moving teeth. This, along with the fact that they require fewer checkups with your orthodontist, makes them one of the more affordable braces for teeth. There are limitations to the kinds of orthodontic cases that can be treated with these braces, however, so they may not be an option for certain patients. Even plain old metal fixed braces have come a long way from the ‘train tracks’ you or your parents may have experienced at school. They have become lighter, smaller, and less noticeable as technology has improved. High-grade stainless steel brackets are attached to each tooth and a flexible metal wire is threaded through each one. Small rubber bands or metal ties are used to secure the wire. By tightening the wire in different places, orthodontists can manoeuver teeth into the desired position. Sometimes they also use larger rubber bands or chains to connect different teeth (from top to bottom) and pull them in certain directions. Occasionally some kind of headgear may have to be worn at night to aid treatment. Having these braces fitted takes 1-2 hours. The process itself shouldn’t hurt, but it’s normal for teeth to feel sore after the initial fitting and after each adjustment. Treatment using a conventional fixed appliance usually takes 18-24 months. During this time you’ll be at increased risk of tooth decay so it’s important to take good care of your teeth and clean your braces carefully. For teens (and even some adults!) one bonus with this style of braces is you can choose the color of elastic band used on each of the brackets. Colored braces at least allow you to make a style statement while your teeth are being fixed. How much do braces cost in the US? The cost of braces for adults is one of the things that prevents many people from seeking treatment, and Medicare doesn’t cover them – or orthodontics in general. There is no such thing as ‘cheap braces’ (and if you find them you should be extremely wary of the person or company offering them). You’re not only paying for the materials used to create the appliance; you must also factor in the time it takes for your orthodontist to fit it and adjust it at each checkup. The price will depend on the style you choose and the length of treatment required, but usually adult braces cost thousands of dollars. Here, you can see roughly how much different types of braces cost for adults with private orthodontic treatment in the US. These prices assume that both the upper and lower teeth are treated. Higher costs may apply if particularly complex work is required. Since clear and white ceramic braces cost more than metal fittings, a common solution is to use ceramic or clear brackets for the top front teeth, (which are most visible), then have metal on the remaining teeth which usually remain out of sight. However, if you really don’t want it to be obvious that you’re wearing braces, Invisalign clear aligners offer the best balance between appearance, cost, and efficiency. You might even find they are cheaper than the other solutions you’re considering. If you have private health insurance, it’s worth checking whether orthodontic work is included. Some insurers cover orthodontia for children insured on a family policy but not for adults. Even so, there is likely to be a maximum payout for this treatment, so you’ll still have to pay a significant amount out-of-pocket. To cover the remaining cost of your braces, you might consider a medical loan. A personal loan for braces lets you pay for your treatment straight away and then spread the cost into regular payments. If you want to find out how much you could borrow, and at what rates, visit our loan comparison partner SuperMoney. It takes a couple of minutes to enter your details, then you’ll receive personalised offers from leading finance providers. Checking your dental loan rates in this way won’t affect your credit score, and there’s no pressure to go ahead with getting the finance. Alternatively, your dentist might offer an in-house finance plan to help you spread the cost of your treatment. Be sure to compare the rates and terms with those of a personal loan so you can get the best deal on your braces finance. First and foremost it is important to check if the dentists or orthodontists in your area are experienced, well qualified, and have opening hours that suit you. Asking the right questions is important. Asking family and friends for a recommendation is also a good idea. Prices for braces will vary across different regions and from one dentist to another, so it’s worth shopping around to get an idea of costs. An orthodontist won’t be able to provide a final quote until they have examined your teeth during a consultation, which may itself incur a small fee. Be sure to check exactly what is included in your quotation and what you’ll have to pay for separately. Consider things like tooth extractions, retainers, mouthguards, and ongoing checkups after your braces are removed. Also, remember that you’ll need to travel to your dentist for regular checkups, so it’s best to find one located near your home or office. In most cases, it’s possible to straighten teeth without having metal glued to them – which is what most people consider braces to be. 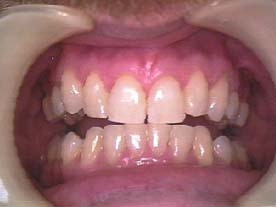 The Invisalign transparent braces, (described above), is one way to do this. It may also be possible to use a dental retainer (pictured) to correct minor problems such as overcrowded teeth. Retainers can be fixed or removable; the latter is formed from metal wire and an acrylic plate that is shaped to fit your mouth. Removable retainers are a good option for people who want to preserve their newly-straightened smile without having fixed wires bonded to the back of their teeth. Removable retainers which need to be worn during the day can easily be taken out for special occasions and to eat. On the downside, they’re easily lost and expensive to replace so a metal retainer may be easier to manage. Orthodontics can achieve some pretty amazing transformations. The time lapse video below shows how a variety of patients’ teeth looked before and after treatment. Orthodontic appliances usually get to work quite fast; the second example above shows teeth just nine weeks after the initial fitting. But even if your teeth start to look better after just a couple of months, it’s likely your treatment will need to continue for a while longer to get your teeth moved into their final position. What’s it like wearing braces as an adult? In many countries, including the US, the high cost of braces for adults (even with insurance) has turned them into a status symbol of sorts. Nowadays, it’s becoming more common for adults to seek treatment later in life – either because they missed out on it as a child or because of the amount that braces cost. It’s still understandable for adults to worry about being treated differently at work, being teased by friends, or being viewed differently by potential partners as a result of wearing braces. This is one of the reasons why alternatives such as removable aligners and clear braces are so popular. Invisible braces not only make it easier to eat but can be taken out for short periods – for example, important meetings – if the wearer is particularly self-conscious. Many people decide it’s worth putting up with a couple of years of awkwardness in order to achieve a smile they’re confident to show off for the rest of their lives. On a practical note, some adult brace-wearers report difficulties with speaking and eating at first, but soon become accustomed to their new appliance and find ways to adjust. Most people get used to wearing braces within a month and no longer notice them after six months or so. So yes, it’s normal to feel some discomfort – especially in the days following each visit to the dentist or orthodontist when your braces are adjusted. There’s a chance you may also experience some irritation to your cheek tissue, which can lead to mouth sores. If you experience severe pain from wearing braces or a wire comes loose and is at risk of causing injury to part of your mouth, you should contact your dentist or orthodontist to make an emergency appointment. While there are some foods you may avoid simply for comfort, there are others that are prohibited altogether if you have a fixed appliance. Invisalign braces offer the most flexibility with eating as they can be completely removed – but remember you must clean your teeth before putting them back in again. You can also cause damage just by biting on hard things like your fingernails or the end of a pencil, so you must be mindful of what you put in your mouth. If your braces get damaged while you’re eating you may not even realize it, and this can prolong your treatment. You may have to pay for certain parts to be replaced, too. These are both good reasons to follow the instructions from your dentist! If you’re concerned about the appearance of your teeth, mention it to your regular dentist at your next checkup. He or she will be able to refer you to an orthodontist if needed. Alternatively, you can book an appointment directly with an orthodontist of your choice. Should you decide you want a certain brand for you or your teenager, such as Invisalign or Damon, you will need to search for orthodontists or dentists near you who offer that particular system. It’s easy to find a local Invisalign dentist – just click the button below to get started. It’s never too late to take the first step towards a more confident smile. You just need to decide which type of braces will suit you best. This probably comes down to a balance between price, comfort, appearance, and results. Is Invisalign the best solution for you? Most teens and adults would prefer to avoid the ‘train track’ metal braces look. Ceramic braces are less obvious than metal but only from a distance, and can be just as uncomfortable. Lingual braces have the ‘invisibility’ factor but a high price tag. Invisalign braces arguably provide the most comfortable, affordable, and efficient straightening solution if you don’t want it to be obvious you’re wearing braces. Remember, you can get started on your Invisalign journey without even visiting a dentist. Begin a Smile Assessment now to find out if you’re one of the 90% of people who can benefit from Invisalign treatment. And if you need help paying for your braces, visit SuperMoney to compare personal loan quotes from competing providers and get a step closer to a smile you’re proud of. Dr. Koch is a board-certified orthodontist committed to keeping himself current with the latest in orthodontic treatment and technology at Koch Orthodontics at Lawrenceville and Loganville, GA. In his quest to provide the best possible care to patients, he actively participates in progressive study clubs and frequently blogs about orthodontic innovations and latest treatment modalities like Invisalign and self-ligating braces. Dr. Koch’s informative posts are a great resource for prospective patients needing a better idea of what orthodontic treatments are really like.